Why the Game Of Thrones Board Game Disappointed Me. My gaming group are all very pragmatic. I rather suspect this is the problem we face with the Game of Thrones board game. The mechanics, I thought, would suit our group perfectly. We love to trick and fight each other, but it never hurts our friendship. We also like the nitty-gritty details and longer games are no problem. Lastly, we all love the Game of Thrones stories. All in all, the game sounded perfect. Well, the first couple games were pretty fun. They took a lot longer than I expected, but they were our first games so I thought they’d pick up. They also contained a fair amount of wheeling and dealing but they all ended fairly flawed. In the first two we were all easily beaten by sneak attacks performed by a much more experienced player. Those sea attacks can be very hard to spot! Ok. Fine. We’ll get better. The first game where we all had equal experience saw one of the players(Baratheon) that were well on their way to victory with a game-long truce with a much weaker player (Tyrell.) So as the game wound down, Baratheon moved to the verge of victory. Everyone knew it, and all previous alliances were restructured into Us vs Baratheon… except… Tyrell didn’t break their truce. They ended the game by moving their pieces OUT of one of their strongholds to allow Baratheon to move in uncontested for the win. “Ha ha!” the Tyrell player crowed, “We win!” Um. No. The silver lining was that in hindsight it looked like we realised Baratheon had the game too late. We’re pretty sure we wouldn’t have been able to stop him any way. Well played, Baratheon. Still, I started to suspect the game wasn’t what I was after. 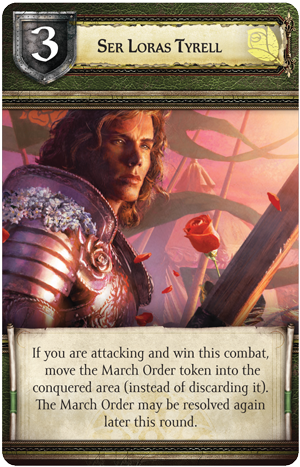 Even if Tyrell HAD switched sides (as logically he should have,) it wouldn’t have exactly been a Game of Thrones-esk betrayal, would it? It would just be a pragmatic attack to improve one’s odds (however slim) of ultimately winning. Subseqent games pretty much played out the same way. Any discussion of non-aggression pacts, alliances, or truces were done on the understanding of: This is just to improve my chances of winning. That is, it may improve yours as well, but we all know I’m only suggesting we stop fighting because otherwise neither of us have a hope. Fine, fine. But if one of us turns this around and starts to win… it’s back on. Ok, that’s the point of the game, but the problem is that it’s not a betrayal, or surprise. Never have I seen a betrayal that would warrant this sort of fist-shaking. It’s just too risky. Occasionally I could see a chance to grab a “free” castle if I tell the guy sitting next to me, who I’ve had an unspoken agreement with since the start of the game, “Oh, that’s a power token. I have no intention of attacking your castle, I just don’t have the resources.” Then, “Surprise!” it’s a march order and I grab me a free castle. Occasionally. And then – is it worth it? Due to all the above issues, no-one is silly enough to leave a castle completely exposed to a so-called ally. So essentially, a Game of Thrones board game turns into a fairly lack-luster war game. One that hasn’t failed to take 8 hours, yet. Since betrayal on the board rarely amounts to anything, the vying for power becomes the most interesting part. Using the raven to look at the wildling deck, or the blind-auctioning for position on the influence tracks. Unfortunately, these make up a very small part of the game compared to moving armies around and my play-group has house-ruled a few small things that makes this part even less interesting. I decided a while ago that it would be a good long while until I break out the Game of Thrones board game again. I broke that rule after a month or two, mostly because it was with an entirely different gaming group… and that 6-hour marathon convinced me that I will probably never break the game out again unless I get begged and begged. Things were no different. Everyone was practical and pragmatic. No alliances, no back stabbings, and the player with the best military strategy won. It was so. Freaking. Boring. Wow, 8 hours huh!? Well, that will spoil most any game for you. AGoT really shouldn’t take more than 4-5 hours with a full complement and we got most of our games done in 3-4 hours (even the first few games). 8 hours is for Twilight Imperium or traditional wargames. I had thought it was just my group’s fault but then when I played with a different group… Pretty much the same thing. And yeah, it probably is the main issue: I know after a couple hours I get bored, and then its a long painful slog to the end where I just wish I was dead…. You would probably like Dune or Rex better. Dune based on the book?